Inspect the outdoor unit panels – Curious about the purpose of these panels? Simply put, they enclose the electrical connections and must be in place to protect you and the system itself. Should you find a missing or misaligned panel, it’s a good idea to contact your local air conditioning repair experts before starting the system. Remove condenser covers, coil blankets, and lids – You were proactive during the fall and covered your system’s outdoor coil with blankets to ensure insulation during the winter. However, many homeowners forget to remove their covers every spring. Unfortunately, doing so typically results in major repairs or replacement of the system. Don’t risk severely damaging your system! Here’s a reminder to remove those covers, blankets, and lids. Remove debris from the outdoor coil – We’ve touched on this in previous posts. It doesn’t take much for leaves, dirt, and other debris to be blown into or against the coil. A system that functions at peak performance is free of such debris. Change the air filters – We advise homeowners to get into the habit of changing air filters once a month. During particularly harsh winters, indoor air filters tend to gather a significant amount of debris and dust. When you go to swap it out, remember to look closely at the airflow direction arrows on the system and filter itself. Turn it on – You probably won’t have to use your A/C regularly until June in Mokena. But that doesn’t mean you should wait until Memorial Day weekend to ensure the system works properly. On a warm spring day, check the air coming out of the indoor vents. You should be all set if you feel cool air coming out of the registers after the first few minutes. If no air is coming out, then be sure to turn the system off at the thermostat and call a professional for air conditioning repair service. Now is the time when homeowners become busy with home improvement projects and spring cleaning. 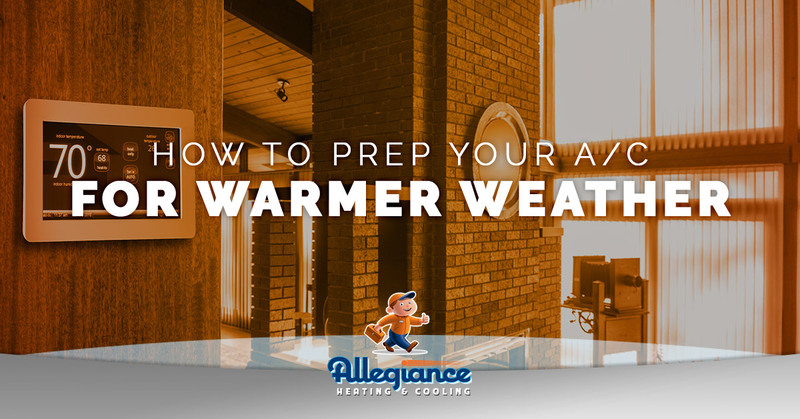 Even with everything on your to-do list, take the time to contact Allegiance Heating & Cooling. Allowing us to perform preventive maintenance now will hopefully save you from requiring emergency air conditioning service during the dog days of summer. Contact Allegiance today for air conditioning repair.